Welcome to another of our potted profiles of the most common Gin Botanicals! This week we’re looking at Coriander, an essential component of most of our favourite gins. If you missed last week’s missive on Juniper, you can find that here. Enjoy! Geography: Although believed to be native to Iran, Coriander grows through a wide region of Southern Europe, North Africa and Western Asia. The oldest archaeological find was from a cave system in Israel, the ancient Greeks are known to have cultivated it since the second millennium BC and, like juniper, coriander was found in King Tutankhamun’s tomb despite not being native to ancient Egypt, meaning that it was cultivated or imported there as well. 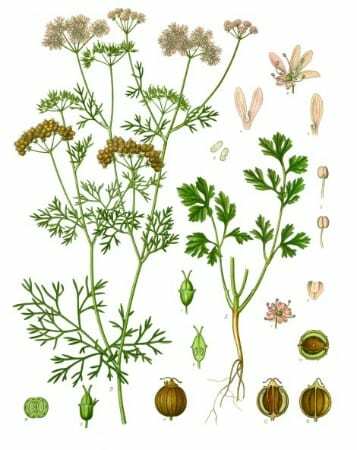 According to the Difford’s Guide, the coriander for gin comes mainly from Morocco, Moldavia, Romania, Bulgaria and Russia, with each country’s seeds having noticeably differing characters. 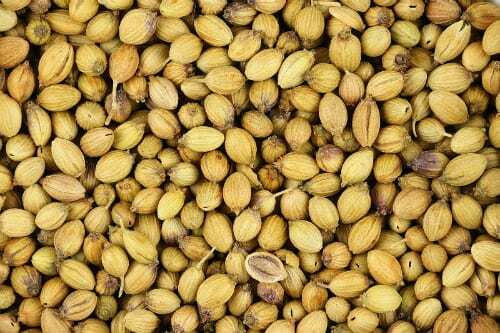 Coriander Seeds (Image from Wikipedia). Characteristics: Coriandrum Sativum is an annual herb of the Apiaceae family, with broad, lobed leaves at the base and small pinkish-white flowers. Coriander usage in gin is almost exclusively of the fruit – known as coriander seed – rather than the fresh leaves. The small, round seeds contain the terpenes linalool – which contributes coriander’s signature citrus and is also present in lavender and cannabis – and alpha-pinene, which is also a crucial component of juniper. If crushed, the seeds release a strong, lemony citrus aroma and flavour. In gin, the seeds contribute nutty, spicy and a restrained citrussy note that most frequently manifests towards the finish. Other Uses: As well as being the second-most frequently used botanical for gin (after juniper), coriander seeds are also a key ingredient in jenever, akvavit, and many wheat beers such as Hoegaarden, where – as in gin – their citrussy flavours compliment the citrus oils from the lemon or orange peels also used in the recipe. Coriander seeds are widely used as a spice in Asian and European cuisine. Ground coriander seeds are a key element of curry powder and the Indian spice blend garam marsala. Roasting the seeds intensifies their flavour and they are eaten in this form in India as a snack (dhana dal). The seeds are also used to flavour sausages in Germany and South Africa, and are commonly found in the pickle juice for gherkins and other pickled vegetables. Coriander leaf, meanwhile, is also a widely used herb in world cuisine. Its prevalence in Mexican food (where it is essential in guacamole), has led to adoption of the herb’s Spanish name, Cilantro, in the USA. Coriander root is also used as a spice in many Thai recipes. Associated Brands: As the second-most utilised botanical, almost all gins use coriander seeds. It is particularly noticeable in Portobello Road, Bombay Sapphire, Tanqueray and, obviously, Sacred Coriander Gin. Fun Fact: It’s well-known that many people can’t stand coriander – but did you know why? Studies have shown that the reason that a minority of unfortunate folk taste coriander as soapy instead of citrussy is genetic – it’s due to an oversensitivity to linalool, coriander’s key terpene.